When the New York Knicks traded for Carmelo Anthony in late February from the Denver Nuggets, they knew they were getting arguably best scorer in the National Basketball Association, and we knew it was a reason to rejoice. 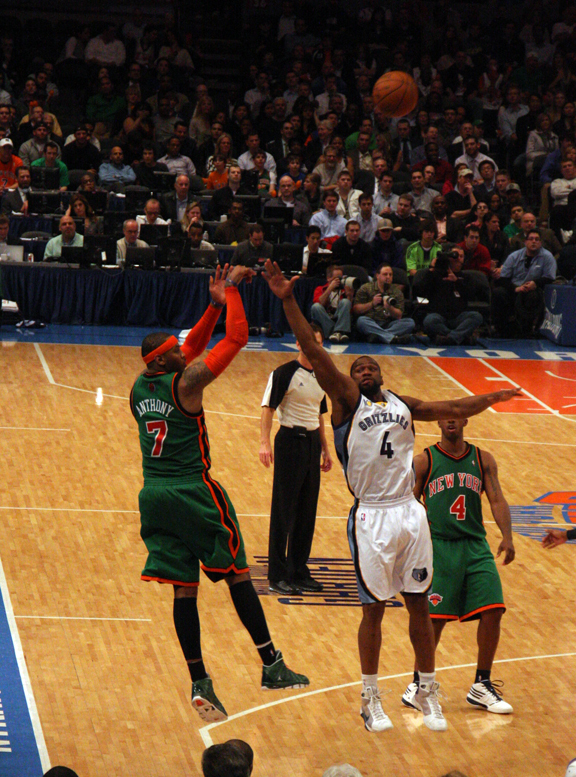 ( http://razzandjazzsports.wordpress.com/2011/02/22/carmelo-knicks-rejoice/) What everyone failed to realize was how good of a three-point shooter he would be with the Knicks. In 50 games for the Denver Nuggets, Carmelo Anthony connected on 42 three pointers, or about 0.8 per game, and shot 33% (43-125) from three-point range. Those numbers aren’t impressive, especially for a talented scorer like Anthony. In 27 games as a New York Knick, however, Anthony has made 53 three pointers, or one short of 2.0 per game, which would put him among the league leaders in makes over an entire National Basketball Association season. His 42% from three (43-125) would also be among the league leaders over the course of an entire NBA season. Furthermore, over his career, Anthony has shot 32% from three-point range for his career. So why the improvement? In the offense run by New York Knicks head coach Mike D’Antoni, the pace of the game allows for transition threes, not only for Anthony, but for others as well. This, combined with playing with Amar’e Stoudemire, who averaged 25.3 on the season, has opened things up for Anthony to space the floor from behind the arc. How important can Anthony’s shooting from three be in a series against the Boston Celtics? In a series that is expected to have numerous close games, a breakout game in which Anthony hits four, five, or even six three pointers could amount to the margin of victory. Carmelo’s shooting from three is indeed a major key.